Understanding the F.I.T.T. principle helps you create a workout plan that will be more effective in reaching your fitness goals. F.I.T.T. stands for frequency, intensity, time, and type of exercise. These are the four elements you need to think about to create workouts that fit your goals and fitness level. Learn how the F.I.T.T. principle works. The first thing to set up with your workout plan is frequency—how often you exercise. 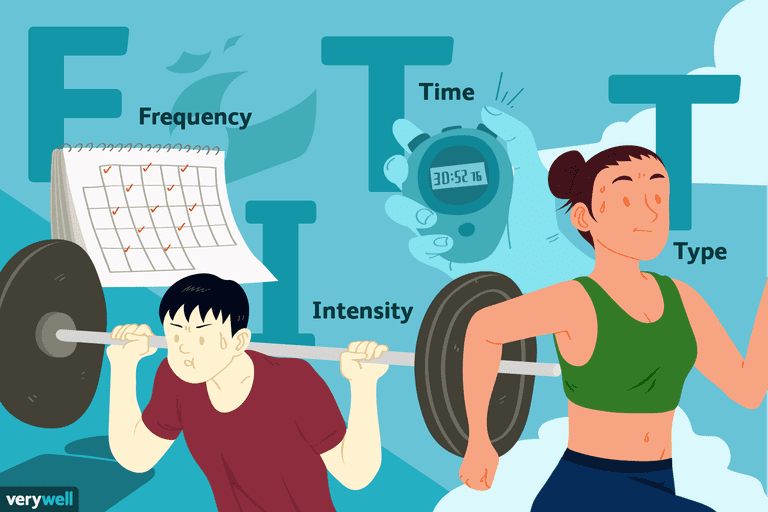 Your frequency often depends on a variety of factors including the type of workout you're doing, how hard you're working, your fitness level, and your exercise goals. In general, the exercise guidelines set out by the American College of Sports Medicine give you a place to start when figuring out how often to workout. For cardio: Depending on your goal, guidelines recommend moderate exercise five or more days a week or intense cardio three days a week to improve your health. If you want to lose weight, you'll want to work up to more frequent workouts, often up to six or more days a week. For strength training: The recommended frequency is two to three non-consecutive days a week (at least one to two days between sessions). Your frequency, however, will often depend on the workouts you're doing, because you want to work your muscles at least two times a week. If you do a split routine, like upper body one day and lower body the next, your workouts will be more frequent than total body workouts. Intensity has to do with how hard you work during exercise. How you can change the intensity depends on the type of workout you're doing. For cardio: For cardio, you will usually monitor intensity by heart rate, perceived exertion, the talk test, a heart rate monitor, or a combination of those measures. The general recommendation is to work at a moderate intensity for steady state workouts. Interval training is done at a high intensity for a shorter period of time. It's a good idea to have a mixture of low, medium, and high-intensity cardio exercises so you stimulate different energy systems and avoid overtraining. For strength training: Monitoring the intensity of strength training involves a different set of parameters. Your intensity is made up of the exercises you do, the amount of weight you lift, and the number of reps and sets you do. The intensity can change based on how you're training. The general idea is to lift enough weight so that you can only complete the number of reps you've chosen. However, if your goal is to lose weight or build endurance, you might lift lighter weights for more reps. The next element of your workout plan is how long you exercise during each session. There isn't one set rule for how long you should exercise and it will typically depend on your fitness level and the type of workout you're doing. For cardio: The exercise guidelines suggest 30 to 60 minutes of cardio but the duration of your workout depends on what you're doing. If you're a beginner, you might start with a workout of 15 to 20 minutes. If you're doing steady state cardio, such as going for a run or getting on a cardio machine, you might exercise for 30 to 60 minutes. If you're doing interval training and working at a very high intensity, your workout will be shorter, around 20 to 30 minutes. Having a variety of workouts of different intensities and durations will give you a solid, balanced cardio program. For strength training: How long you lift weights depends on the type of workout you're doing and your schedule. For example, a total body workout could take up to an hour, whereas a split routine could take less time because you're working fewer muscle groups. The type of exercise you do is the last part of the F.I.T.T. principle and an easy one to manipulate to avoid overuse injuries or weight loss plateaus. For cardio exercise: Cardio is easy to change, since any activity that gets your heart rate up counts. Running, walking, cycling, dancing, and the elliptical trainer are some of the wide variety of activities you can choose. Having more than one go-to cardio activity is the best way to keep your body guessing and reduce boredom. For strength training: Strength training also has a variety of types of workouts to offer. It includes an exercise where you're using some type of resistance (bands, dumbbells, machines, etc.) to work your muscles. Bodyweight exercises can also be considered a form of strength training. You can easily change the type of strength workouts you do, from total body training to adding things like supersets or pyramid training to liven things up. The F.I.T.T. principle outlines how to manipulate your program to get in shape and get better results. It also helps you figure out how to change your workouts to avoid boredom, overuse injuries, and weight loss plateaus. Your body becomes more efficient at exercise: The more you workout, the easier it is to do the exercises, causing you to burn fewer calories than you did when you started. Weight loss: Your new workouts may assist weight loss which, of course, is a good thing. The downside is that you expend fewer calories moving that new, smaller body around. Boredom: Doing the same workout for weeks or months on end can get old, eating into your motivation to exercise. Changing the type of workout by swimming, cycling, or running. Even just changing one of these elements can make a big difference in your workout and in how your body responds to exercise. It's important to change things up on a regular basis to keep your body healthy and your mind engaged. Garber CE, Blissmer B, Deschenes MR, et al. Quantity and Quality of Exercise for Developing and Maintaining Cardiorespiratory, Musculoskeletal, and Neuromotor Fitness in Apparently Healthy Adults. Medicine & Science in Sports & Exercise. 2011;43(7):1334-1359. doi:10.1249/mss.0b013e318213fefb. Is Carb Cycling an Effective Dietary Approach? How Can I Burn More Fat When Exercising? Do You Really Not Have Any Time to Exercise? Should You Try LL Cool J's Platinum Workout?